At Finovate, 56 companies vied to be the next big thing in personal finance. From pay-by-smartphone to smarter banking, here's what was new and cool. Imagine getting the bill at a business dinner and simply pressing a button on your personal credit card to transform it into your corporate card. Or checking out at a grocery store and pressing the same button to turn your debit card into your credit card. Dynamics lets customers carry a single card but choose between multiple accounts when paying for items. Pressing a small button automatically reprograms the paper-thin card's magnetic stripe -- which is then swiped in a retailer's credit card machine. 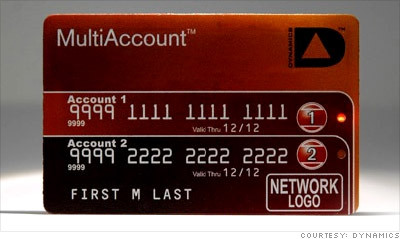 Other Dynamics cards let consumers choose if they want to purchase items using their rewards points or rewards cash. Worried about security? Another card variation hides account numbers until you punch in your personalized passcode -- on the card. Dynamics' technology is creeping toward release: Citi has been testing the cards out with a limited group of customers over the last year, and Dynamics executives say they expect to soon be ready to announce other partnerships.